Over the past year or so, I’ve been enjoying playing Warmachine, a tabletop miniatures game. Though the game itself is fun, most of the enjoyment I’ve gotten from Warmachine has been the hobby elements of the game, especially painting. With a little bit of practice and some common sense, you can get good results. 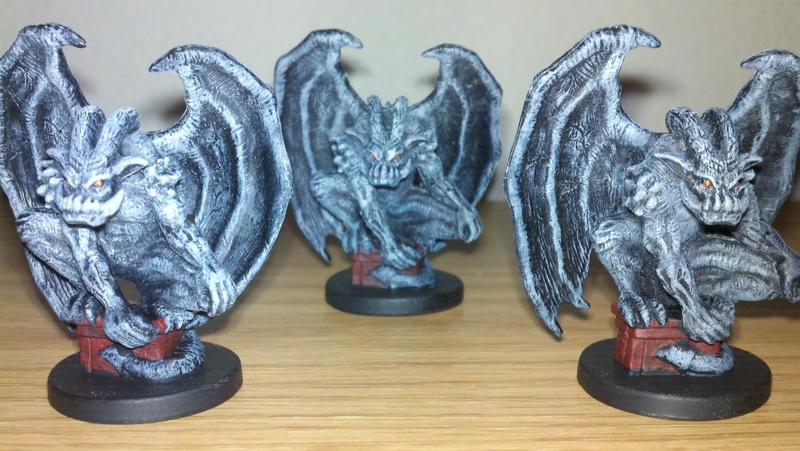 I’ve also painted my Castle Ravenloft board game minis, and have used them in my D&D games. Like many others, I am looking forward to receiving my Reaper Miniatures Bones Kickstarter shipment soon. I thought it might be a good time to share some miniatures painting tips for other beginners like me. Today, we’ll discuss setting reasonable expectations for yourself, plus some supplies you’ll need to purchase to get started. If you are like me, you will be disappointed by the results of painting your first minis. Like any other skill, you will get better and better the more you perform over time. The toughest mini to paint is always the first one, because you keep telling yourself you can’t do it. But you really can! Just keep at it, and over time your results will be more and more acceptable. Let me just say right away that I know that I am not a great painter. I’m not even a good painter, but the quality I have achieved, such as it is, is acceptable to me. 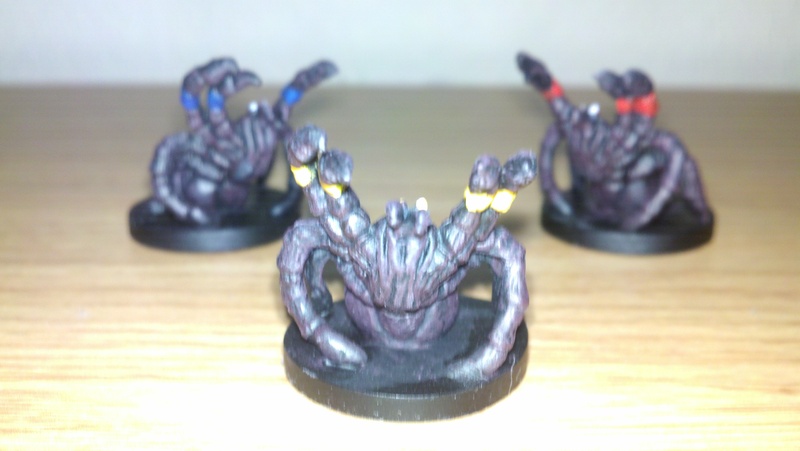 The Ravenloft minis I painted myself don’t look out of place next to standard D&D or Dungeon Command minis. That was the goal I set for myself, and it’s a good expectation in mind as you begin. Your minis may not win any painting contests, but with a little practice, they will work just fine for your tabletop. It would be very easy to walk into a game store and spend hundreds of dollars on paint bottles, high-quality brushes, expensive primer, and the like. Don’t do this. For the most part, avoid your local game store and head to a craft store like Michael’s, Hobby Lobby, or even Wal-Mart. You wouldn’t buy a Stradivarius violin for a novice, so don’t break the bank as a new painter. You will want a set of brushes. Don’t go for the cheap plastic brushes kids use at school. I recommend a pack of a half dozen or so in various sizes. You can probably find a set like this one for $8 to $12 at most places. 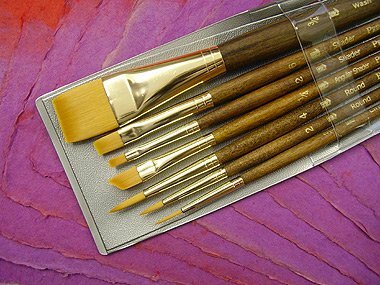 You’ll get the most mileage out of the smaller brushes, since miniatures are small (obviously). Don’t worry about a super fine brush at the moment. Details like teeth and eyes can be done with toothpicks for now, or just left undone. Over time you will develop brush control, and when you do, that’s the time to pick up better brushes. Primer is a very important part of your starter tools. Primer allows the paint to bond better with your mini, making the process easier and the final result smoother. I recommend Dupli-color Sandable Primer. It’s intended for automotive use, and can be found at most auto parts stores, or the link above. It is very reasonably priced and has excellent coverage. I prefer to prime my minis in black, which gives good shadows but can require extra paint coats at times. Some people prefer gray or even white. Your choice of paint will be the most important. There are many brands and types out there, ranging in price and quality. Obviously, you get what you pay for. Game store brands like Privateer Press P3 or Games Workshop are very good quality, but will run $3 to $4 for a small bottle. That can get very expensive, especially when you are starting from scratch and need lots of colors. These should be avoided from the start, with a few exceptions. I’d go ahead and spring for metallics from these brands, as the cheap metallics are noticeably harder to get good results with. If you use bright reds or yellows often, it also might be worthwhile to get better paints, which tend to have better coverage. Cheap paints from a craft store are your best value as a beginner. Brands like Apple Barrel, Folk Art, and Americana are fine. Be sure to get acrylic paint, as it is easy to use and cleans up with water. As far as color selection, it really depends on what you are painting. 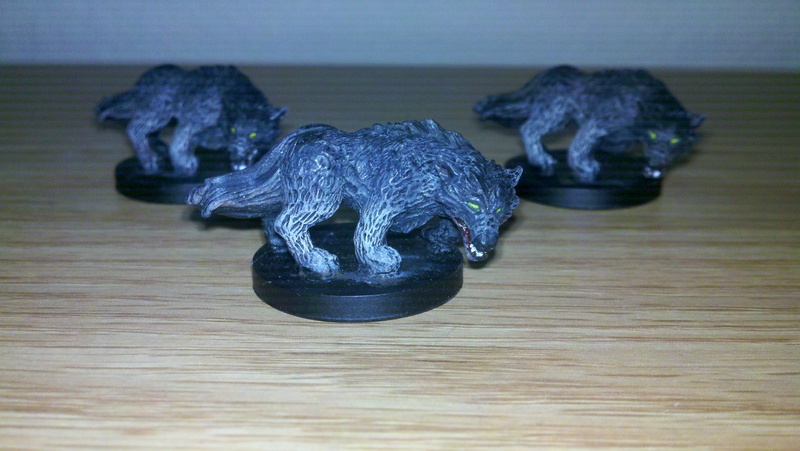 For the Ravenloft minis, I used lots of grey, black, brown, and other dark colors. Just buy what you need for your first few minis. 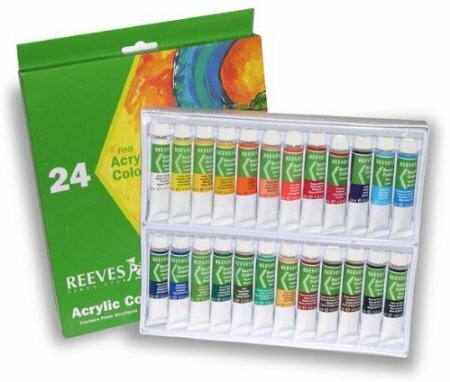 A friend of mine had good results with an acrylic paint set like this one. In general, these cheaper paints are mixed very thick, so always blend in a drop or two of clean water when you use them. You will want to pick up an ink to use as a wash. Ink acts differently than paint does, flowing naturally into crevices and details. Using an ink wash will cover a multitude of mistakes, which is great news for a beginner! I’d recommend a brown ink to begin. Black is too dark, but a blue ink can be useful if you plan to paint lots of armor and other metallic surfaces. I like P3 Brown Ink and Armor Wash, but you might be able to find less expensive inks at a hobby store. To round out your collection of supplies, you’ll need a few more inexpensive items. A paint tray is good for mixing and thinning your paints. Two containers, for clean and dirty water, are needed; I use old baby food jars for this. Keep an eyedropper handy as well. Lastly, you’ll want a can of Testor’s Dullcote. When your minis are finished, a quick spray of this will lessen the gloss of the paint, making the fabric, metal, hair, and skin look far more realistic. This post is already fairly long, and there is plenty more to cover, so I’ll wrap it up here. Painting miniatures can seem like a difficult thing, too much trouble to mess with. However, if you keep your expectations reasonable, and have the appropriate supplies for the job, you’ll be able to get results you can be happy with. In my next post, we’ll look at the process of painting a mini from start to finish. My wife has recently taken a liking for mini painting. It began when she decided to improve the paintjob on the “Legend of Drizzt Set” Icingdeath dragon, which is a good miniature but has a very, very bad paint work. Then she painted a mini for her new deva paladin, but she adapted an elf warrior because she hates the 4e official deva design. I would love to see the repainted Icingdeath! I thought it was by far the best paint job on all the Icons dragons. If it’s improved, it must look fantastic. Thanks for commenting!